It seems the very dedicated Al Cabino just might have his way after all. For years, the man has been behind a grassroots effort to get Nike to manufacture the sneakers Michael J. Fox wore in the 1989 movie Back to the Future 2 during the year 2015 scene. 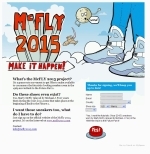 A petition site McFly 2015 has been launched to collect signatures and convince Nike there's a market for the shoes. Oh, naturally, there's a MySpace site too.